Genesys International – a Queen’s Award winner for international trade. This case study interview was conducted by Kathryn McCann, a blogger for the Yell Business Knowledge Centre, which provides impartial digital marketing advice from a team of independent experts. On 14 July 2016, specialist chemical company Genesys International received their third Queen’s Award in a ceremony at Buckingham Palace. This was their second Queen’s Award for Enterprise in International Trade – they also received one in 2011 – and they had already won a Queen’s Award for Enterprise in Export in 2005. Genesys International manufacture antiscalant and cleaning chemicals for reverse osmosis, nanofiltration and ultrafiltration membrane systems, which are used around the world to purify water. The small but fast-growing company is based in Middlewich, Cheshire, where they have a factory and research and development laboratory. They also have a membrane autopsy lab in Madrid. Since Genesys was established in 2001 they have built up a network 67 distributors, who sell their products and services worldwide, with the support of a team of industry expert account managers. The volume of products sold has doubled over the past six years and they’re currently experiencing their best year yet. When I joined Genesys in 2006 we had just eight distributors. We now have 67. During that time sales have grown by five times and 93% of this is through export. Initially companies all over the world offered to sell Genesys products but never actually did. We even gave some of them exclusivity. We’ve now learned from this and made distributors sign an agreement which specifies that they will only maintain exclusivity if they meet specific targets, which increase up to a certain level. If they don’t perform to our expectations, either we won’t renew the contract or we’ll adjust the terms, taking away their right to exclusivity. That means distributors know they’ve entered into a serious contract. This discipline is important. We also now insist that new distributors place an order with us before we fly out to provide support to get them set up. help them run workshops to raise awareness in their target markets. We promise up to four visits in the first year. That’s a vital part of getting distributors on board. If a potential distributor doesn’t see the value in what we’re offering and doesn’t commit to placing an initial order, they’re not for us. This helps to sort the wheat from the chaff. Developing a good relationship with a distributor’s owners and directors is crucial to a successful partnership. In addition to visiting them, we also invite them to our biennial distributors’ conference here in the UK. 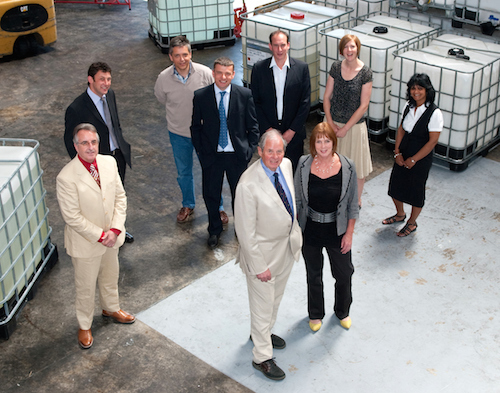 Most of our regional account managers are very technically experienced in the water industry. Some are new to this area but have other relevant experience in industries that use a lot of water, such as oil and gas and mining. We’ve just employed a former copper miner. We give our account managers very free rein and trust them to make the right decisions. For example we allocated each of them with a marketing budget, so they can spend without seeking prior approval. Many of them have worked for large corporations before, so they really value the flexibility and lack of micromanagement and don’t take advantage of it. Genesys International being awarded with the Queen’s Award. Travel is vital. Even when funds are tight, it’s never worth implementing a travel ban. In our case, I can say that the expense of each trip abroad, on flights, hotels etc, is repaid at least ten times in business won as a result. We support distributors at exhibitions and conferences all over the world. We put someone on the stand to help them and sometimes even part fund their attendance. We maintain a high profile at events, including through presenting papers. We used to go to a lot of big international water exhibitions, but these are becoming less worthwhile these days, now people can find so much information on the internet, so there are fewer potential customers attending and everyone’s there to sell. The attendance is even decreasing at regional exhibitions, so these days we’re finding that helping our distributors set up their own events for potential customers is more worthwhile. We’ve also started attending events for other sectors that use a lot of water, such as oil and gas, power and food and drink, to establish our profile as water experts there. Adding scientific research papers to our website, most of which analyse the effectiveness of our products on cleaning challenging membrane deposits, has been massively important for us. We give away more technical information than most of our competitors but it helps to establish us as an authority. We get at least 15 sales leads a week from our website. In order to download a paper, data sheet or application guide, people have to enter details, including their name, email address, phone number and location. These details are automatically sent to the relevant distributors and regional account manager. I always encourage them to pick up the phone and call the people who have downloaded resources to see whether there is any way we can help them. Actually speaking to someone over the phone is a really powerful way to engage with them – much more impactful than dropping them an email. Winning a high profile client is a great way to establish your credibility. This happened with us recently in Bangladesh. Once we’d gained one significant government contract, with help from our local Chamber of Commerce, we had a lot of enquiries from other Bangladeshi organisations. Spending time at one large plant in Algeria resulted in four other similar plants becoming interested in our services. Everyone wanted our account manager to come and visit them and were even happy to pay for the visit. People talk to each other, and word of mouth is a very effective sales tool. Most of our new business comes from customer reference, and just having a deal with a major name is a great marketing tool. Big customers who are happy with Genesys products are always willing to tell anyone who asks about them, but just the mention of a big name is often enough. Have a tight system to control debtor days. You can’t grow unless you have the funds behind you – you have to pay for your flights, as well as your staff and raw materials. It’s important to collect money from distributors in a timely way. We agree payment terms individually with different distributors, including a credit limit and how long they have to pay each invoice. For example for some in areas with financial challenges we insist they pay up front. Our credit control system alerts distributors directly if an invoice becomes overdue. A copy of the alert goes to the relevant account manager and a phone call is often enough to get the funds transferred very quickly. If a distributor doesn’t pay us within an acceptable time frame, we won’t release their orders until they get back within the terms. Working closely with our distributors to encourage them to pay us promptly and consistently motivates them to ensure their customers pay them. If your company is already involved in export, what are your top tips?